I got into pineapple farming through my family and I now work with my father Gary. Our farm produces 1,000,000 pineapple plants and we also grow custard apples. Choosing a good pineapple is as simple as looking at the appearance and their size. Once picked they are ready to eat so I don’t leave them lying around too long as they won’t get any better. Fixing the gear and moving dirt are some of the things I love to do around the farm and if I wasn’t a grower I would be a Diesel Mechanic! I love eating pines fresh, fresh, and fresh but when I cook them, my favourite recipe is Sweet N’ Sour Chicken, with pineapple of course, it so simple! 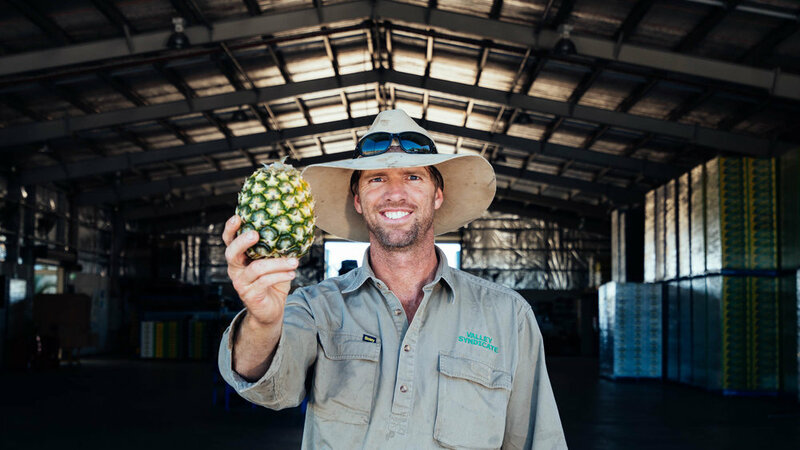 One of our big challenges in the pineapple industry is crop spread, and we try to harvest as many weeks a year as possible to look after our customers who are always coming back for more. With The Pure Gold pineapple eating so well all year round, consumers are now learning to trust the fruit right through winter too and eat pineapple all year. In my spare time I enjoy Wakeboarding and Snowboarding, both a fair bit cooler than picking pines in 40 degrees! 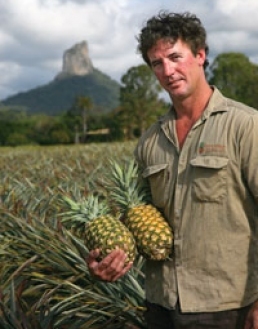 I own and work on a beautiful Pineapple farm called Lake Mary Pines, at Bungundarra west of Yeppoon. I became a pineapple farmer through my family. My father & mother, Col and Gail Stevens started farming in 1980 at our original property near Lake Mary. I joined my parents on the farm in 1998 because I wanted to and I love farming. My preferred farming operation is boom spraying as I get to assess the patch, but I’ll put my hand to anything that arises on the farm. I feel the biggest challenge we face as pineapple producers are extreme weather conditions. We were hit particularly hard by the Cyclone in 2015. 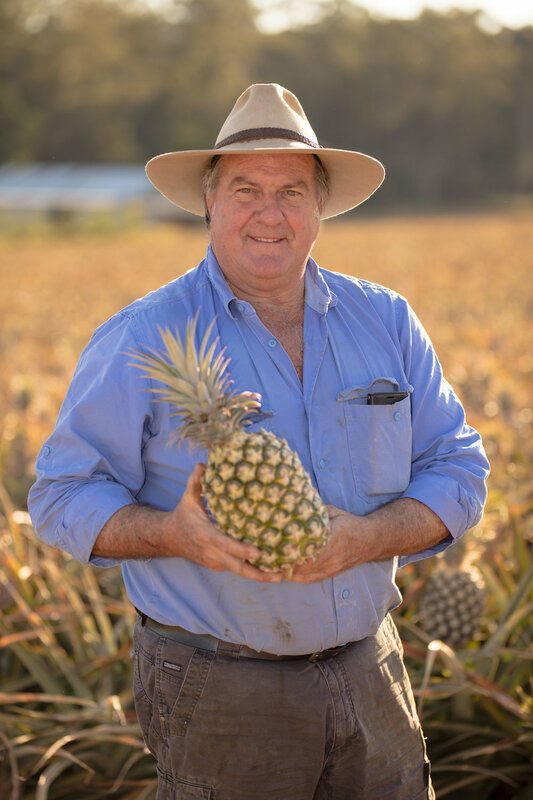 Our Farm produces 1.5 Million pines per year, mostly Pure Gold’s varieties and a selection of Yeppoon Pineapples for summer. The two key elements to look for when choosing your fruit are colour and flavour (Sugar) and to ensure you are buying perfect fruit look for our well-known labels and always check the fruit for freshness. My favourite way to eat pineapple is in a salsa on a fresh caught barbequed barramundi, but I also love it on its own, or diced with finely chopped red onions and mint sauce. If I wasn’t a farmer I would be a fisherman as it’s one of my favourite pastimes. Our farm is called “Valley Syndicate” a name given to our original farming business a long time ago. My Brother in Law and I have started this new farm from scratch at the current property at Bungundarra. After a few very difficult years of hard work and long hours, the new farm is up and running and producing some great fruit. The big challenges include the variable weather and input costs which have been massive on the new property. The farm produces about 1.6 million pines per year with two varieties, Pure Gold for the fresh market and also Smooths for Golden Circle. Two tips and key elements of choosing and eating pineapples are making sure you buy them fresh and trusting us growers to pick a perfect pineapples for you and then put our label on it to ensure good quality. I love eating pines straight off the bush first thing in the morning! I also enjoy them on burgers and pizza. I’m a hard worker with a mischievous streak who like’s a joke. I got into farming in 1981 following the family tradition with my brother Murray. I was keen, even though my mum didn’t really want me to, but it was a good decision. We grow 1.6 Million pineapples a year, originally all smooths for Golden Circle, but now mostly Pure Gold as it’s a better quality fresh fruit and giving us a good farm gate return. I judge a good pineapple by its texture and flavour and make sure the skin is still nice and firm and the base leaves are still green. I enjoy ploughing on the farm, but if I wasn’t a pineapple grower, I’d be a publican! No surprise that in my spare time I enjoy riding my motorbike, playing and watching footy, and the occasional rum! I like my pineapple fresh and chilled or diced with passion fruit and ice cream, but I recommend you try a pineapple and cinnamon rum punch. My beautiful farm is called “Bonny Rig” and I took up the challenge of pineapple farming in 1972. As the second generation, I didn’t want to see the farm leave the family. I am easy-going, hardworking and dedicated to growing a good pineapple. Fresh healthy plants are a must when planting and choosing the right time gives the plants a good growth start. All of these factors lead to bumper crops with good fruit size. Having said that, Keeping up market demand in winter and ever changing climate conditions are a couple of the challenges we face each year. In summer the fruit doesn’t need to be so coloured as its always riper inside and in winter the fruit needs more colour, to make sure you get great flavour. If I wasn’t a pineapple farmer I’d be a builder, but growing something from the ground is just as good. When I get a chance, I love to go touring on my motorbike. My favourite way of eating a pineapple is first thing in the morning picked straight off the bush cut and eaten right there. At home, I love a Classic Aussie Fruit Salad or stewed with custard for something warmer. My brothers and I run our farm on Tanby Road. Our sister Helen is also helping with accounting. You could call us a family orientated business for sure. The first farm we worked when we were younger, before and after school with our father, was at Bondoola. “Wheeler View” - It was a beautiful big place dad and ended up producing Charbray cattle there as well. It had a great view of Mount Wheeler and just by coincidence our new farm has a beautiful view of the very same mountain. I joined my parents on the farm in 1975 because I love farming and I was born into it. It just seemed the natural thing to do. When I’m working on the farm I run the picking crew, taking care of quality. I feel the two big challenges we face as pineapple producers are weather conditions and rising costs. Keeping our sanity is right up there as well. Our Farm produces 1.2 Million pines per year. All Pure Golds. If I wasn’t a farmer I would be a Policeman I have always thought that would be an excellent career. But fishing is one of my favourite pastimes although I don’t get enough opportunity to do it. My favourite way to eat pineapple is fresh in the patch, and I also enjoy pineapple tart. You know what, anyway is good as far as I am concerned. I really liked the idea of a farming life so I joined the business with my brother in 1999. If I wasn’t a pineapple farmer I would like to be a cattle producer. That too would have given me a life on the land. But my father was already in the pineapple business so I followed in his footsteps gladly. My best tips for buying a pineapple are look for some colour in winter, smell the fruit for sweetness and while you looking make sure the fruit doesn’t look tired and old. I love eating pineapple on a burger but it’s also great in sweets, and my favourite is Pineapple and Custard tart which Christie makes for me and the kids. While I’m home from work I love my family time and my favourite pastime away from work is pig hunting. Pigs love to eat pineapples as well and cause a lot of damage to the local farms. Throughout my life I have always been respectful, punctual and precise. I took over in about 1988 because Dad had retired. If I hadn’t I would more than likely be working as a Diesel Fitter but that was not meant to be. The farm carries about 550,000 pines, mostly pure golds and some Smooths, we hope for good weather when we are farming and while the plants are in the growing stages We aim to give them the best nutrition and attention possible so we achieve the best results. Overheads and rising cost can be a challenge at times and we also have to deal with whatever mother nature sends our way. The best way to pick lovely fruit is making sure in winter there is some external colour showing that is not necessary in summer. Smell the scent for sweetness if it makes your mouth water your onto a good thing. I enjoy nothing more than eating pineapple fresh in the patch and it’s also good on a burger. But my pick is a pineapple-passionfruit slushy’s and my wife and I enjoy them on our caravanning get-aways. I’m outgoing, friendly and loyal and I work our farm along with my brother’s Chris and Scott. We are 4th Generation farmers and I was 15 years old when I started. I have always been keen on farming so I haven’t looked back really. It’s our 100th year of the Fullerton family growing pineapples in 2015. We grow 2.3 Million pines on the farm with Pure Golds for the fresh market and Smooths for Golden Circle. We also grow Macadamia Nuts. Growing a good crop always depends on weather conditions, timing and soil treatment for a successful yield. How well we sell the fruit and the running costs are all the other factors that determine good returns. When choosing your fruit, look for a nice shaped pineapple, take them home, cut them up put them in the fridge to cool down then eat. I love them “fresh chilled” straight off the plant in the morning. My favourite pineapple recipe is Pina Colada and a Sweet chicken curry is great as well. If I wasn’t a farmer I’d be a refrigeration mechanic and in my spare time I love fishing and shooting. My name is Roberto Sergio Emidio Frizzo and I am very proud to describe myself as an Italian Aussie Farmer. I have been in the family business since 1969 working on various family properties full time. Now I am carrying on the family tradition with thanks to my father and Grandfather, but it does feel like a natural progression. The farm produces about 600,000 pines per year with weather and market fluctuations being two challenges we face. Choosing a piece of fruit at your local supermarket is as simple as buying your fruit from a reputable retailer, buy a brand you are familiar with and check the aroma, it should smell lovely and sweet. Lastly, if you get a chance to taste it you can’t go wrong. The great potential and opportunities in this industry are enough motivation to keep me going for quite a while but if I weren’t farming I would be a Surveyor. For me when eating pineapples, fresh is best! But I recommend a simple Lebanese Bread Ham and Pineapple Pizza. This is closely followed by fruit salad and as an addition to the great Aussie barbecue. My favourite past time is being a Rhee Tae Kwon Do Instructor. Sam Pike Sandy Creek Pineapple Co.
I’m Sam Pike. I am driven, fun and hyperactive. I got into pineapples following the family tradition, being the third generation to grow pineapples in the shadow of Mt Crookneck on our original farm. We now have some additional holdings with my father Murray and are committed to growing for the fresh market. Knowledge and Organisation are two big challenges we face on the farm along with the day to day management of planting, maintenance, and harvesting in a timely manner. As one of the youngest growers in our industry, I have a great opportunity to learn from the best around and plan for the future. We grow Pure Golds and Smooths. When you’re out buying a pineapple appearance is the first great way to see if the fruit will be tasty. If the skin looks dull and flat, then chances are that piece of fruit is getting old. Use your nose and smell for a sweetness, your eyes and nose will never lie. If I wasn’t a pineapple farmer I think I’d be a packing shed manager. I love eating pineapple cut fresh in the patch; I love Col Stevens' famous pineapple salsa. For me though, an open steak sandwich with pineapple takes some beating. When I’m not on the farm I enjoy Wakeboarding it makes a great hobby. I’m Wayne Moffat from Moffat Farming Brothers. I’m a shy, happy workaholic and I started farming in 1971 through my family because Dad and his brothers had the farm. The farm grows 500,000 plants with the varieties of Pure Golds and Smooths. When we are preparing to plant we use a specific selection of plant material (usually the pineapple crown) so we gain optimum size and quality. The sun is a big factor when producing pineapples. Mother Nature will alter the outcome every time so good or bad weather has to be taken into consideration for sure. When choosing your pineapple, look for colour, smell the aroma and enjoy. For something a bit special, try cooking them with Bourbon and brown sugar on the BBQ. If I wasn’t in pineapples I would probably be a labourer and in my spare time I keep Bee Hives.